On Friday, November 11, 2011, at 7pm, Loganberry Books will host a release party for my first book, Hidden History of Cleveland. The author will talk and sign copies of the book. Refreshments will be served. There will be a door prize, including Cleveland Area History swag and local history books. 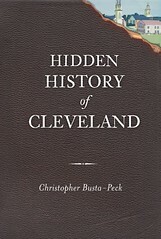 In Hidden History of Cleveland, Busta-Peck unearths aspects of Cleveland’s past that dangle too near extinction from city memory. Too often, we think of history as something that happens elsewhere. But it’s not. Travel down East 100th Street to the home where Jesse Owens lived when he shocked the world at the 1936 Olympics. Ascend the stairs to Langston Hughes’s attic apartment on East 86th, where the influential writer lived alone during his formative sophomore and junior years of high school. From the massive Brown Hoist Building and the Hulett ore unloaders to some of the oldest surviving structures in Cleveland, Busta-Peck has Clevelanders talking about history again. Loganberry Books is located at 13015 Larchmere Blvd, Cleveland, OH 44120. It is in the heart of the historic Larchmere neighborhood. It is the largest independent bookstore in Cleveland. Loganberry has the largest selection of local history books in Cleveland, including many unique and hard to find items. If you're unable to attend, there will also be a signing at Mac's Backs, on Coventry Road in Cleveland Heights, on Tuesday, November 15, at 7pm. Other signings and events will be announced as they are scheduled. I would love to make it to this if we're not closing on our new old house that evening! Maybe you can do both? Just rush through the paperwork - what could possibly go wrong? Congrats Christopher! I'm babysitting for a friend tonight and am catching up on a few months of posts. So exciting!